A state-of-the-art mousing accessory, the Rockstick 2 Wireless Mouse from Goldtouch is here to change up your mousing game completely. An updated "rocker" design allows users to switch between hands for ambidextrous comfort that they'll notice instantly. 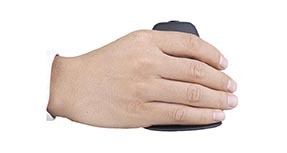 The Goldtouch Rockstick 2 Wireless Mouse is cordless and ready to use out of the box, making the mousing experience much more ergonomic with one simple handheld addition. The Goldtouch Rockstick 2 Wireless Mouse is available in two sizes to better fit your ergonomic needs. Measure your hand from the bend of your wrist to the tip of your ring finger. $79.00 List Price: $99.99* The list price is the same as the MSRP (Manufacturer's Suggested Retail Price). It may not necessarily be the price at which the product is sold.